Frankenstein, Canada's best producer on the mic, first stepped on the scene in 1994 with his partner AZ (as the duo Delphi Oracle) to release their debut 12" single "Peace And Quiet" on Frankie’s own Knowledge of Self label imprint. After going solo and dropping underground classics like "The Pain", "Rain Is Gone", and "What Does It All Mean", Frankenstein released his much sought after and critically acclaimed debut full-length "UV" in 1997. 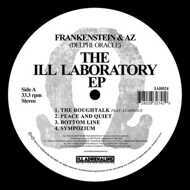 "The Ill Laboratory" EP is entirely produced by Frankenstein and includes three tracks from the original 12" singles plus six previously unreleased gems.